This month I only have 3 books to tell you about as I actually also did a Christmas special review and wrote about some of the books we have been reading there. Click here to see them. So here are Decembers books. I can't say that this is the most exciting of stories but it is a nice little book. All about a cute little penguin that when hatches is lost. It thinks its getting attacked by lots of different animals but there actually trying to help it get back to its mummy. It doesn't have a huge narrative to it and only a few words on each page but I thought it was a nice looking story to read over Christmas as it has lots of snow in the book. Though it wasn't the best written of books, Lily did really enjoy it as she loved all the animals in it and loved that it had a mummy figure in it. I picked this book up from The Works quite a while ago now. I Love this book as its such a lovely story and beautifully illustrated. The story is all about a hedgehog on its way through a terrible winter. He is wearing a lovely warm hat and scarf and gloves which in the book are actually a material feeling that you can touch. He comes across lots of animals that are in need of help and warmth and kindly gives them his clothes. After the storm dies down, Hedgehog finds he has no home left, but the nice animals who took his clothes all built him one to say thank you. I think the book has lovely morals in it about helping those who may need it more. Again picked this book up from the Works a while ago. This story has a nativity story line to it and so to begin with I thought it may be a little much to read to Lily with her being so young yet. She only just learning about Christmas itself so not sure the story of Jesus is something she needs to learn yet. But when we did actually sit down to read this story I really liked it. It was about the nativity but written in such a way that its not to obvious. The story is set from a point of view of a cow living in the stable. She really wants to go to sleep. First some rabbits come and need a place to sleep, then a fox, and then suddenly a lady who is just about to have a baby. The cow makes room for the women and the baby is born. Some Shepherds come and visit the baby and then leave and everyone to the cows delight, finally sleeps. The cow just see's it as a tiring night but also knows that there was something special about it. I think its a really good way to read to your young children the nativity without it being to detailed, and to much about religion. Would really recommend this story for your children at Christmas time. Which of these 3 books do you like the sound of the most? I like the sound of the Little Lost Penguin. Love the artwork too! 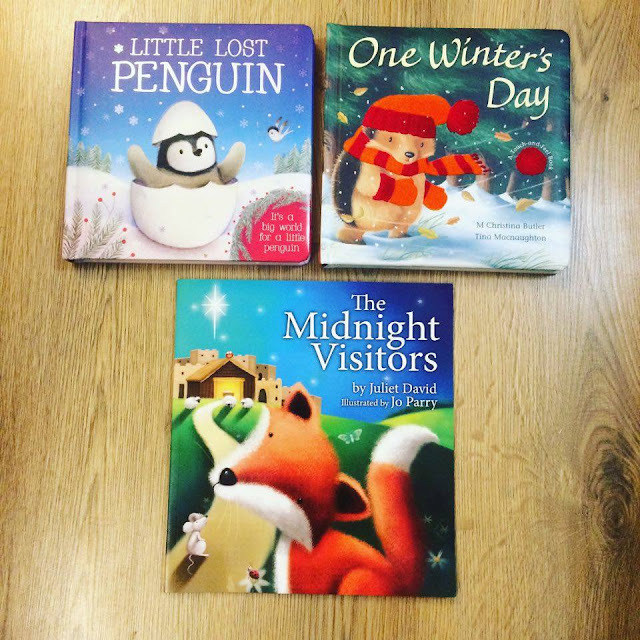 The midnight visitors-I love a childrens nativity themed book, I love reading them to my children to try and get across the spirituality of christmas! The little lost penguins sounds good. Some beautiful books there, I love the sound of The Midnight Visitors - By Juliet David.